On the surface, Ivy Bean looks like a normal 104 year-old. She lives in a senior care home community. She mourns the deaths of her friends and loved-ones that have passed. She values the time she spends with her friends. But Ivy Bean is not your typical 104 year-old: Her social network currently numbers over 60,000 people! 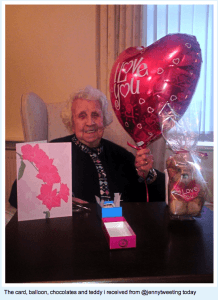 Through the use of Twitter, a social networking website, Bean and other residents at the Hillside Manor care home have connected with thousands of people across the world. Ivy Bean with Valentine’s Day gifts she received from another individual on Twitter. Twitter is a website that allows users to interact with other individuals using updates, called “tweets”, of 140-characters. Bean regularly tweets about getting her hair done with her good friend Mabel, eating fish and chips, and about watching her favorite game show, “Deal or No Deal,” on TV. She also updates with photos, giving others a glimpse into important events in her life. For Bean, Twitter is an activity that is free and allows her to engage in exciting conversations, providing stimulation for the mind and joy for the heart. “We’re trying to provide them with something different than knitting or crochet,” explained Pat Wright, manager of Hillside Manor care home. Bean has captured the attention of many major news networks, including an article published by CNN. Twitter provides a great way for seniors to engage their minds in stimulating conversations while having some great fun at the same time. To begin tweeting and connecting with others, visit www.twitter.com to sign up for a free account.